Spelling & punctuation will appear exactly as you entered it on your order, so if you want an apostrophe "s" to a name, you must add it. If you need more then 25 characters, please contact us. Please note, the more characters you request, the smaller the text will be. Also, the personalization is case sensitive, so if you want it in all capital letters, type in your personalization in all capital letters. Case sensitive. Your choice of text for 2nd line. Add this rustic large Personalized Sports Bar Planked Wood Sign - Beer Mug to your home bar area, game room, man cave, garage or other favorite space. Comes personalized with your name and a 2nd line of text and can be easily hung. Ideas for a 2nd line of text are established date, city and state, a favorite saying or even a declaration to your favorite team or hobby. 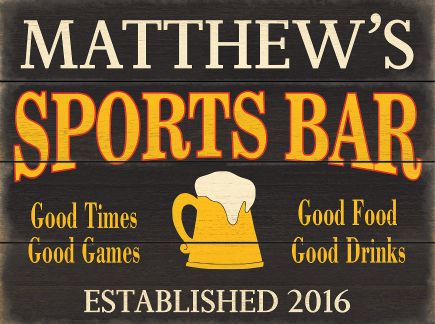 This high quality Planked Sports Bar Sign ships quickly, is made to order and comes ready to hang. Measures 22 in. x 14 in. and is made of solid wood - rustic 3/4" lumber. Stained and aged for a vintage effect. 1-2" long sawtooth hangers provided. Wood signs are nearly 2" thick with hardware. Made in the USA. Each sign and colors on the sign may vary slightly due to the natural wood grain. This sign should only be hung indoors. A Man Cave Gifts Exclusive! PROCESSING/SHIPPING: Approximately 2-3 business days for processing and 2-4 business days for shipping. NEED IMMEDIATELY? See IN A RUSH? See Holiday and Father's Day Shipping Schedule in May, June, November & December.